Attractions include a huge Christmas tree, Carters Steam Fair entertainment, free lantern workshop and Christmas carols sung by local schools. Add a large Christmas market, a lantern procession of over 100 people through the town centre, hot food, mulled wine, lights switch-on ceremony, bouncy castle, carousel and live music and you have all the hallmarks of a great event! Last years event was a big occasion and proved extremely popular with families, office-workers/commuters and visitors – so why not make a date to come along and have some fun with friends! 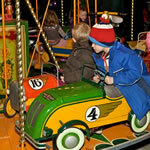 Children love the rides, food, school choirs and family fun; while the live music, hot mulled wine, fine beers and hot food and entertainment keep the adults amused! 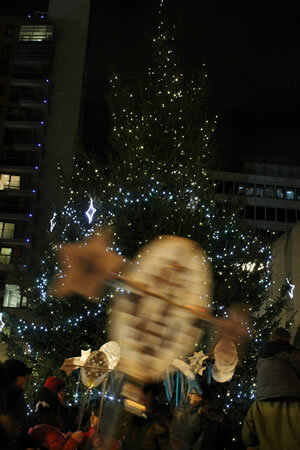 Wandsworth Council organise and support the event in conjunction with the Putney Partnership/Putney Commercial Forum; including the market, festive lights, entertainment and event promotion. Enormous thanks go to our generous sponsors for supporting this event, particularly ‘key’ sponsors Chamberland Residential local estate agents, St James property developers (also sponsors of the Lantern Procession & workshop), and Chesterton Humberts estate agents (also sponsors of the Christmas Tree), with additional help from Putney Rotary and the Putney Society.